Bread. Brown Bread. Ms. Dudley. 1 qt. 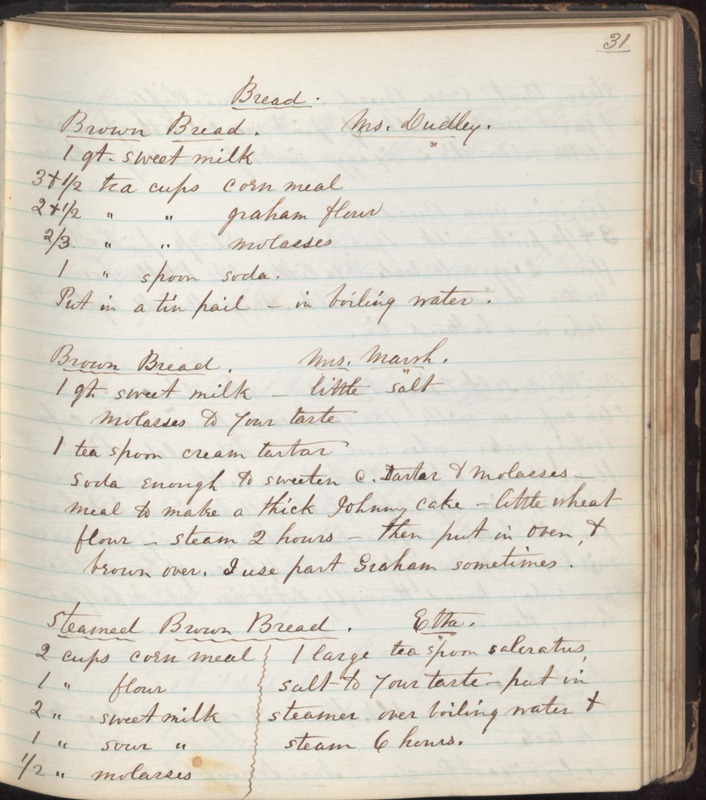 sweet milk 3 + 1/2 tea cups corn meal 2 + 1/2 " " graham flour 2/3 " " molasses 1 " spoon soda. Put in a tin pail - in boiling water. Brown Bread. Mrs. Marsh. 1 qt sweet milk - little salt molasses to your taste 1 teaspoon cream tartar soda enough to sweeten c. tartar + molasses meal to make a thick Johnny cake - little wheat flour - steam 2 hours - then put in oven + brown over. I use part Graham sometimes. Steamed Brown Bread. Etta. 2 cups corn meal 1 " flour 2 " sweet milk 1 " sour " 1/2 " molasses 1 large teaspoon saleratus salt to your taste - put in steamer over boiling water + steam 6 hours.